A great resolution this year is to put aside some money each week for emergencies. It's obvious we should be doing this, but few consistently have. Home storage is more than food storage. It's living providently and preparing for adversity. Some may feel they have nothing to spare. But even $2.00 per week will build a financial reserve. Look at this wonderful promise from President Gordon B. Hinckley: “Set your houses in order. If you have paid your debts, if you have a reserve, even though it be small, then should storms howl about your head, you will have shelter for your wives and children and peace in your hearts” ("To the Boys and to the Men," Ensign, Nov. 1998, 54). 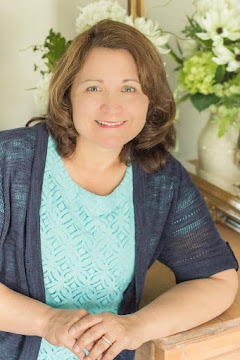 I love reading this phrase: "with careful planning, you can, over time." The key is careful planning and over time. Of course you could put the fund together quickly if you already have the cash. A financial reserve is STEP 3 of the 4-Step Approach to Home Storage, but it can be done simultaneously with STEP 1: 3-Month Food Storage Supply and STEP 2: Drinking Water if your finances allow it. A financial reserve is something we want to create before we work on a longer-term food storage supply: cans, buckets or Mylar bags of wheat, rice and beans, etc. We might need the financial reserve sooner than we think, and it helps prevent us from going into debt for emergencies. Personally, I make regular transfers from a checking account into a savings account. A couple of times a year, I get a sum of money out of the bank in small bills and keep it in my home to use for emergencies. So I have it in both places. I don't like to have it all in the bank because during a disaster, that money is inaccessible to me. 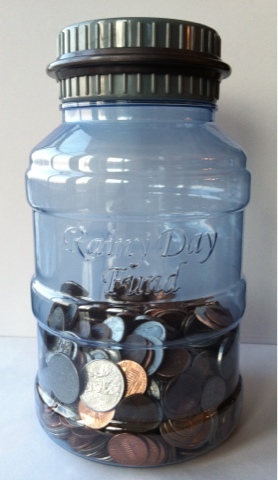 I also have a Rainy Day counting jar that is about the size of a mason jar. (See picture above.) Guess how much is in it? You will be shocked to know that it currently has $50.74 and it isn't even filled up yet. So, what's a "reasonable amount" of money for a financial reserve? For some $100 may seem about all you can do, while others will gather several thousand dollars. Dave Ramsey, author of "The Total Money Makeover" recommends you start with $1000 as a goal, but Dave Ramsey has no idea what your finances are and neither do I. Only you can decide what your goal will be, but you need to decide and just have faith and do it. Take a look at the following charts to see help you decide what you want as a goal. Emergency Scenario #1: You just went through a major disaster. You can't leave the city and need some supplies. The power is out and the grocery store isn't accepting ATM or credit cards, but they will take cash. Emergency Scenario #2: You've suddenly been asked to evacuate because of a fire on the mountain near your home. You hope you can eventually drive to your sister's house out of town, but suddenly the roads are congested with traffic. Everything is at a standstill and you could only make it to the next town. You can't go back and you can't go forward. You need gas, food and water, and possibly a hotel room. Put it in several locations. Some in the bank and some at home. Protect it from water and heat damage. Keep a small amount hidden in your car for roadside emergencies. Keep a minimum of $100 per person at home. Make sure your trusted older children know where it is. You may not be home when they need it. Through consistent effort you can succeed one step at a time. I know it because I'm doing it. And you CAN too. What a great post! I love the numbers you use as examples....it really makes saving thousands seem totally do-able. And the simple promise from Pres. Hinckley is so motivating! Thanks! Love President Hinckley. He is a prophet who truly saw our day and wanted to prepare us for it. Can I just say how wonderful you are?!. These posts and your organization are priceless. I just bought a case of evaporated milk at the store today and it is in my cupboard. I have done an inventory of our water and plan to pull cash aside tonight to keep in a safe place at home. Bit by bit :) Can't wait to share with the sisters in our ward tomorrow. Thank you! I am so happy you are catching the vision! Our Church leaders are truly inspired and I love it!